Contrary to popular belief, search engine optimization (SEO) goes beyond keywords. In fact, Google (and other search engines, consider lots of different factors, from those trusty keywords, to page load time, domain maturity and more when they determine where to rank your site in search engine results pages (SERPs). If you’ve mastered keyword optimization and want to take your SEO skills to the next level, images are a great place to start. Unless you are a photographer, you more than likely aren’t thinking about Google crawling your site and looking for images. But, optimizing images for search doesn’t only increase rankings for your images. Image SEO can help boost your rankings for your target keywords. Pretty nifty, huh? Google knows all, which is why you can’t trick them. Just like with regular, keyword-based SEO, don’t try and pull a fast one on the master. It will hurt you in the end. Just because Google has the ability to read these details, doesn’t mean they always do. You can improve your search engine rankings by making it a little easier on search engines by telling them about the image as opposed to making them hunt the information down. Here are five ways to increase your image SEO. Always use a descriptive file name for your image title. If you are using original photography, cameras will output the manufacturers’ settings, such as “DCS_0022.jpg.” While that may be convenient for storing files on your computer, it doesn’t do anything for SEO. Name your file with descriptive words about the image. Don’t be cute, be direct. Use a relevant description where the words are separated by hyphens (remember, Google reads hyphens to assume where spaces between words should be placed) not underscores. Keep it simple. You don’t need to go overboard and load your image description with related keywords. Think about how people search. Most of the time, they’re asking questions, not plugging keywords into Google. ALT tags represent an HTML field that provides search engines more information about the image. The ALT tag was primarily intended to improve accessibility, but marketers have found that ALT tags are a requirement for maximizing the SEOh impact of images. While every other point in this article can impact how your images are found, the ALT tag field is directly correlated with telling search engines more information about the image. Don’t skip it. You can use ALT tags to expand on the file name using context. For example, the image I used at the top of this blog uses the filename “optimize-images-for-seo.jpg.” Because that is the precise longtail keyword I am looking to optimize this blog for, I used the same ALT tag. 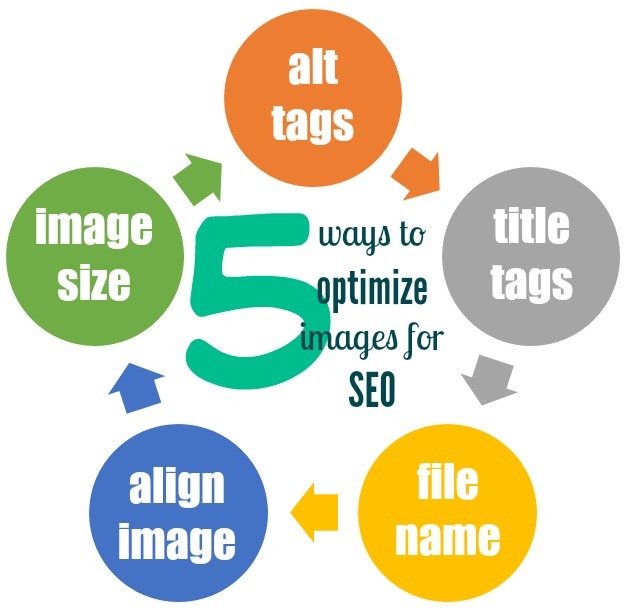 If I had titled the image simply “optimize.jpg”, I could use “optimize your images for SEO” as the ALT tag in order to expand upon my short image title. Your tag should be short. Keep it to one sentence or less. ALT tags are exceptionally important. They provide search engines with contextual clues that provide insight into the message or information you are trying to convey and this, in turn, can have a dramatic impact on your SEO. When Google finds an image without a descriptive file name or an ALT tag, it will attempt to understand the contents of an image by crawling the surrounding copy. Captions are one of the first locations search engines crawl to determine more information about an image. Captions are tricky because they don’t look very appealing. On WordPress in particular, you can always notice a caption by the “lovely” gray or tan box that appears around your entire image when a caption is added. Before you add a caption, make sure it is relevant to your image, adds value, and won’t become a distraction. While they can help with SEO, captions are a non-essential item. ALT tags and Titles hold far more weight and have the added benefit of not being visible to your website visitors on the front end. These days, SEO is all about speed. As a society, we’ve become accustomed to getting the information we need quickly and as a result, are less willing to wait for a website or web page to load. Search engines know this and are looking to deliver the best possible experience to the people who use them to find information. As a result, your site’s search engine rankings can be harmed if it takes too long for pages to load. One of the biggest factors that influences page speed is image size. Images to be used on the web should always be 72 dpi (dots per inch). The quality required of an image to be used on the web is drastically different from one suited for print quality. Always make sure your images are “saved down” to accommodate page speed. Images can be amazing visual differentiators for a website, but make sure the images you are using are relevant. It may seem super appealing to follow the large image trend, but if your image isn’t aligned with your site’s aesthetic or content, then why go to the trouble? Make sure that the contents of the image are relevant to your on page copy. Every image won’t have or doesn’t need a caption, so pay careful attention to the copy surrounding your image. Does the copy support the image contents? If your answer is no, choose a different image. Don’t go overboard. SEO is an incredibly complex field, and there are people whose entire job is SEO. Optimizing your sites images isn’t going to take you from the tenth page of Google to the first, but it will help Google to understand your site better and will improve your rankings. If you haven’t ever paid attention to your image titles and ALT tags, start reviewing what assets you already have and identify a strategy to use these tactics moving forward.